Dr. Kathleen M. Rasmussen is the Nancy Schlegel Meinig Professor of Maternal and Child Nutrition in the Division of Nutritional Sciences and International Professor of Nutritional Science at Cornell University. She received her AB degree from Brown University in molecular biology and both her ScM and ScD degrees from Harvard University in nutrition. 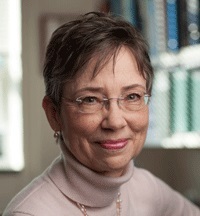 Professor Rasmussen is internationally known for her research on maternal and child nutrition. Her research has included studies in experimental species, observational and intervention studies in human subjects in the US and several developing countries, and epidemiologic studies based on data from medical records and large cohorts. She and her students have established that interventions to improve maternal nutritional status can increase the volume and improve the composition of human milk and, thereby, improve infant nutritional status. They have also shown that women who are overweight or obese at conception have problems establishing and maintaining breastfeeding and have babies who are heavier at one year of age than those of normal-weight women. In addition, they have shown that there is a trade-off between meeting the needs of the pregnant or lactating mother and the needs of her fetus/breastfed infant, respectively. Most recently, her students have explored many aspects of the process of using human milk expression to meet breastfeeding goals. Professor Rasmussen has been a member of several expert committees at the Institute of Medicine. She served as the chair of the Committee on Reexamination of IOM Pregnancy Weight Guidelines, and more recently as the Chair of the Committee to Review WIC Food Packages. Her research was recognized by the Agnes Higgins Award of the American Public Health Association in 2012 and the Macy-Gyorgy Award of the International Society for Research on Human Milk and Lactation in 2016. She the Conrad A. Elvehjem Award for Public Service in Nutrition from the American Society for Nutrition in 2017. Professor Rasmussen has served as program director for two NIH-sponsored training grants in maternal and child nutrition. She teaches a nationally recognized course in maternal and child nutrition for graduate students that supports these training grants. She also teaches a unique course on public health nutrition for undergraduate students. In 2006, she was the first recipient of the Excellence in Nutrition Education Award from the American Society for Nutrition. Continuing her long interest in mentoring the future leaders in nutrition, Dr. Rasmussen helped to develop the Dannon Nutrition Leadership Institute in 1998 and served as its principal faculty member until it ended in 2017. She received the Dannon Institute Mentorship Award from the American Society for Nutrition in 2009. At Cornell, Professor Rasmussen has served as what is now called the Director of Graduate Studies in the Division of Nutritional Sciences; she is currenlty the Director of Undergraduate Studies. She was elected by the University Faculty to serve as the Associate Dean and Secretary of the University Faculty and subsequently as a member of Cornell's Board of Trustees elected by the University Faculty. Broadly, we are studying the relationship between maternal nutritional status during the reproductive period and short- and long-term maternal and child health outcomes. In the US and elsewhere, we have been studying the association between maternal obesity and reduced duration of breastfeeding, why this occurs, and the consequences that it has for both maternal health and infant feeding practices. We are also investigating how the now-widespread practice of breast milk expression, specifically how it affects maternal health and infant feeding practices. With colleagues in Scandinavia, we are studying the effects of reproduction in general, and lactation in particular, on long-term maternal health. Monterrosa EC, Frongillo EA, Neufeld LM, Egan KA, Ramakrishnan U, Rasmussen KM. Maternal pre-pregnancy body mass index is not associated with infant and young child feeding in low-income Mexican children 1-24 mo old. Mat Child Nutr 2015;11:215-8.. doi: 10.1111/j.1740-8709.2012.00461.x. Epub 2012 Oct 15. Kirkegaard H, Stovring H, Rasmussen KM, Abrams B, Sørensen TIA, Nohr EA. The relationship between pregnancy related weight changes, breastfeeding, and maternal weight and waist circumference 7 y after delivery–a path analysis. Am J Clin Nutr. 2014;99:312-391. Hauff LE, Leonard SA, Rasmussen KM. Associations of maternal obesity and psychosocial factors with breastfeeding intention, initiation and duration. Am J Clin Nutr 2014;99:524-534. Brekke HK, Bertz F, Rasmussen KM, Bosaeus I, Ellegård, Winkvist A. Effect of intervention with diet, exercise or both on cardiovascular risk factors in lactating women. PLoS One 2014;9:e88250. Knabl J, Riedel C, Gmach J, Ensenauer R, Brandlhuber L, Rasmussen KM, Schiessl B, von Kries R. Prediction of suboptimal gestational weight gain from week specific cut-off values: a cohort study. J Perinatol 2014; 34:351-356. Bjerregaard LG, Rasmussen KM, Michaelsen KF, Skytthe A, Mortensen EL, Baker JL, Sørensen TIA. Effects of infant weight and weight gain on body mass index from early childhood through adulthood. Int J Obesity 2014;38:1305-1311. Rasmussen KM. Editorial: Helping women to conceive at a healthy weight and gain within the guidelines. Int J Childbirth Educ 2014;20:10-11. Garner CD, Ratcliff SL, Devine CM, Thornburg LL, Rasmussen KM. Health professionals’ experiences providing breastfeeding-related care for obese women. Breastfeeding Med; 2014;9:503-509. Kirkegaard H, Storving H, Rasmussen KM, Abrams B, Sørensen TIA, Nohr EA. Maternal weight change from prepregnancy throughout 7 years postpartum–the influence of behavioral factors. Obesity 2015;23:870-878. Kirkegaard H, Nohr EA, Rasmussen KM, Storving H, Sørensen TIA, Lewis CE, Gunderson EP. Maternal prepregnancy waist circumference and BMI associated with gestational weight gain and breastfeeding behavior: the CARDIA study. Am J Clin Nutr 2015;102:393-401. O’Sullivan EJ, Perrine CG, Rasmussen KM. Early breastfeeding problems mediate the negative association between maternal obesity and exclusive breastfeeding at 1 month an 2 months postpartum. J Nutr 2015;145:2369-78. Felice JP, Rasmussen KM. Breasts, pumps and bottles, and unanswered questions. Breastfeeding Med 2015;10:412-15. Garner CD, Ratcliff SL, Thornburg LL, Wethington E, Howard CR, Rasmussen KM. Discontinuity of breastfeeding care: “There’s no captain of the ship.” Breastfeeding Med 2016;11:32-39. Felice JP, Cassano PA, Rasmussen KM. Pumping human milk in the early postpartum period: its impact on long-term practices for feeding at the breast and exclusively feeding human milk in a longitudinal survey cohort. Am J Clin Nutr 2016;103:1267-1277. Cheikh Ismail L, Bishop DC, Pang R, Ohuma EO, Kac G, Abrams B, Rasmussen K, Barros FC, Hirst JE, Lambert A, Papageorghiou AT, Stones W, Jaffer YA, Altman DG, Noble JA, Giolito MR, Gravett MG, Purwar M, Kennedy SH, Bhutta ZA, Villar J. Gestational weight gain standards based on women enrolled in the Fetal Growth Longitudinal Study of the INTERGROWTH-21st Project: a prospective longitudinal study. BMJ: 2016;325:i555 (doi:10.1126/bmg.i555). Garner CD, Rasmussen KM. Clarifying the breadth of strategies: A Response to "An alternative strategy to solve the problem of the discontinuity of breastfeeding care". Breastfeed Med. 2016:11;264-265. O’Sullivan EJ, Geraghty SR, Rasmussen KM. Informal milk sharing: a qualitative exploration of the attitudes and experiences of mothers. J Hum Lact 2016;32:416-24. Editor’s Choice. Lignell S, Winkvist A, Bertz F, Rasmussen KM, Glynn A, Aune M, Brekke H. Environmental organic pollutants in human milk before and after weight loss. Chemosphere 2016;159:96-102. Yamada R, Rasmussen KM, Felice JP. Mothers’ use of social media to inform their practices for pumping and providing pumped milk to their infants. Children (Basel) 2016;3(4):pii:E22. O’Sullivan EJ, Rasmussen KM. Development, construct validity, and reliability of the questionnaire on infant feeding: a tool for measuring contemporary infant-feeding behaviors. J Acad Nutr Diet 2017;117:1983-90. doi: 10.1016/j.jand.2017.05.006. Rasmussen KM, Felice JP, O’Sullivan EJ, Garner CD, Geraghty SR. The meaning of “breastfeeding” is changing and so must our language about it. 2017;12:510-14. doi: 10.1089/bfm.2017.0073. Rasmussen KM, Whaley SE, Pérez-Escamilla R, Ross AC, Baker SS, Hatfield T, Latulippe ME. New opportunities for breastfeeding promotion and support in WIC: Review of WIC Food Packages, Improving Balance and Choice. J Nutr Educ Behav 2017 Jul - Aug;49(7S2):S197-S201.e1. doi: 10.1016/j.jneb.2017.04.007. Leonard SA, Rasmussen KM, King JC, Abrams B. Trajectories of maternal weight from prepregnancy through postpartum and associations with childhood obesity. Am J Clin Nutr 2017;106:1295-1301. doi:10.3945/ajcn.117.158683. Rasmussen KM, Pérez-Escamilla R, Baker SS. Fruit juice and fruit in the Special Supplemental Program for Women, Infants, and Chidren food packages. Letter to the Editor. JAMA Pediatr 2017; 171:1229-30. doi:10.1001/jamapediatrics.2017.3559. Rasmussen KM. Association of resting energy expenditure with fat gain during pregnancy. Editorial. Am J Obstet Gynecol. 2017;217:387-8. doi: 10.1016/j.ajog.2017.06.031. Fox EL, Pelto GH, Rasmussen KM, Debrosse MG, Rouzier VA, Pape JW, Pelletier DL. Who knows what: An exploration of the infant feeding message environment and intracultural differences in Port-au-Prince, Haiti. Matern Child Nutr 2018;14:e12537 doi: 10.1111/mcn.12537. McKenzie SA, Garner CD, Rasmussen KM. Experiences and perspectives about breastfeeding in “public”“ a qualitative exploration among normal-weight and obese mothers. J Hum Lact. 2018;34:760-766. doi: 10.1177/0890334417751881. Yourkavitch J, Rasmussen KM, Pence BW, Aiello A, Ennett S, Bengtson AM, Chetwynd E, Robeinson W. Early, regular breast milk pumping may lead to early breast milk feeding cessation. Publ Health Nutr. 2018 ;21:1726-36. doi: 10.1017/S1368980017004281. El Arifeen S, Ekström E-C, Frongillo EA, Hamadani J, Khan A, Naved RT, Rahman A, Raqub R, Rasmussen KM, Wagatsuma Y, Persson LÅ. Cohort profile: the Maternal and Infant Nutrition Interventions in Matlab (MINIMat) Cohort in Bangladesh. Internat J Epidemiol. 2018;47:1737-1738e. doi:10.1093/ije/dyy102. Kirkegaard H, Bliddal M, Størving H, Rasmussen KM, Gunderson EP, Køber L, Sørensen TIA, Nohr EA. Breastfeeding and later maternal risk of hypertension and cardiovascular disease–the role of overall and abdominal obesity. Prev Med. 2018;114:140-148. doi: 10.1016/j.ypmed.2018.06.014. Fox EL, Pelto GH, Bar H, Rasmussen KM, Young SL, Debrosse MG, Rouzier VA, Pape JW, Pelletier DL. Capturing changes in HIV-infected, breastfeeding mothers’ cognitive processes from before delivery to five months postpartum: An application of the pile sorting technique in Haiti. Curr Dev Nutr. 2018;2:nzy017. doi: 10.1093/cdn/nzy017. eCollection 2018 Jun. O'Sullivan EJ, Geraghty SR, Rasmussen KM. Awareness and prevalence of human milk sharing and selling in the United States. Matern Child Nutr. 2018;14 Suppl 6:e12567. doi: 10.1111/mcn.12567. Ragavan R, Dreibelbis C, James BL, Wong YP, Abrams B, Gernand AD, Rasmussen KM, Siega-Riz AM, Stang J, Casavale KO, Spahn JM, Stoody EE. Dietary patterns during preconception/pregnancy and maternal outcomes: A systematic review. Am J Clin Nutr. In review. Ragavan R, Dreibelbis C, James BL, Wong YP, Abrams B, Gernand AD, Rasmussen KM, Siega-Riz AM, Stang J, Casavale KO, Spahn JM, Stoody EE. Dietary patterns during preconception/pregnancy and birth outcomes: A systematic review. Am J Clin Nutr. In review. Osendarp SJM, Bourassa MW, Adu-Afarwuah S, Ahmed S, Ajello C, Allen L, Bergeron G, Black R, Christian P, Cousens S, de Pee S, De-Regil LM, Dewey K, El Arifeen S, Engle-Stone R, Fleet A, Gernand AD, Hoddinott J, Klemm R, Kraemer K, Kupka R, McLean E, Millat H, Moore SE, Ndiaye B, Neufeld L, Persoon L-Å, Rasmussen KM, Shankar A, Smith E, Sudfeld C, Udomkesmalee E, Vosti S. Review of the evidence regarding the use of antenatal multiple micronutrient supplementation in low- and middle-income countries. Ann NY Acad Sci. In review. Rogers AB, Yaktine AL, Rapporteurs, Institute of Medicine and National Research Council (Committee on Implementation of the IOM Pregnancy Weight Gain Guidelines). Leveraging Action to Support Dissemination of the Pregnancy Weight Gain Guidelines: Workshop Summary. Washington, DC: National Academies Press, 2013. Raiten DJ, Raghavan R, Porter A, Obbagy JE, Spahn JM. Executive summary: Evaluating the evidence base to support the inclusion of infants and children from birth to 24 mo of age in the Dietary Guidelines for Americans--"the B-24 Project". Am J Clin Nutr. 2014;99:663S-91S. Rasmussen KM, Latulippe ME, Yaktine AL, eds. Institute of Medicine (Committee to Review WIC Food Packages, Food and Nutrition Board). Review of WIC Food Packages: An Evaluation of White Potatoes in the Cash Value Voucher: Letter Report. Washington, DC: National Academies Press, 2015. Rasmussen KM, Latulippe ME, Yaktine AL, eds. National Academy of Medicine (Committee to Review WIC Food Packages, Food and Nutrition Board). Review of WIC Food Packages: Proposed Framework for Revisions: Interim Report. Washington, DC: National Academies Press, 2015. National Academies of Science, Engineering and Medicine (Committee to Review WIC Food Packages, Food and Nutrition Board). Review of WIC Food Packages: Improving Choice and Balance: Final Report. Washington, DC: National Academies Press, 2017. Professor Rasmussen teaches a graduate course on maternal and child nutrition (NS6140) in the fall semester and an undergraduate course on public health nutrition (NS4500) in the spring semester. She advises graduate students in Nutrition and undergraduate students in the Nutrition and Human Biology, Health and Society major; she also advises undergraduates in research.